When whales, birds and primates chat, they're not just letting loose chirps or chitters in an easy-to-predict series - instead, animal vocalizations have more language-like characteristics than thought, according to scientists in a study published Wednesday. Previously, many scientists have attempted to use mathematical models called Markov chains to decode animal sounds. Under the Markov model, a hypothetical animal might randomly snort or howl based only on her previous grunt, ignoring all the grunts, howls and snorts she had made before. But when researchers at the National Institute for Mathematical and Biological Synthesis examined the sounds of seven critters across the animal kingdom, from killer whales to chickadees, they found vocalizations were much more complex than Markov chains. A male rock hyrax (a mammal resembling a big guinea pig) makes only five different types of sounds, but he can string these wails and chucks together into long proclamations of territorial ownership, the authors point out. "Language is the biggest difference that separates humans from animals evolutionarily," Arik Kershenbaum, study author and biologist, says, "but multiple studies are finding more and more stepping stones that seem to bridge this gap. Uncovering the process underlying vocal sequence generation in animals may be critical to our understanding of the origin of language." Animal language, as Kershenbaum says, doesn't directly mirror ours. When a vervet monkey shouts "Leopard!," it's more an exclamation of "Ouch!" than a word, according to a 2010 article in the New York Times. Campbell's monkeys can combine two calls to generate a third with a different meaning. The males have a "Boom boom" call, which means "I'm here, come to me." When booms are followed by a series of krak-oos, the meaning is quite different, Dr. Zuberbühler says. The sequence means "Timber! Falling tree!" 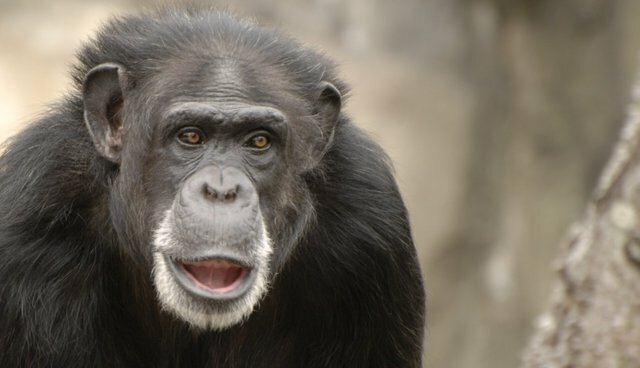 If you'd like to hear what chimpanzee communications sound like, you're in luck - on Tuesday, researchers released over 10 hours of chimp "hoocalls," "tonalgrunts" and other sounds, recorded at Gombe National Park, Tanzania, in the early ‘70s. Hoocall away!